If you’re thinking about starting a planted tank, perhaps the first question you will have is how do you give the plants enough light to thrive? After all, light is arguably the primary need of any plant. And when we go to the local fish store to find supplies for our tank, we’re faced with a huge assortment to choose from. How can we know which is the best? In nature, light is plentiful. Day after day, the sun supplies more light than the plants will ever be able to use. Artificial lights, such as the ones we use for our aquariums, are, by contrast, puny. While our eyes are able to accommodate this weak light and hardly notice a difference, the amount of energy it can supply plants is not comparable to what they would receive outside. Anybody who has ever put an aquarium next to a window can tell you how much of a problem that amount of light can create. Theoretically, one could use the natural sunlight from a window as the primary light source for a planted tank, but the challenges would be extraordinarily complex and nobody would recommend trying. There are many styles of aquarium light and each style comes in a range of brightness levels. How can you decide what light to choose? You need to look at the needs of the plants you are trying to grow, the other equipment you’re willing to invest in, and how much work you’re willing to put in. Most people separate plants into three categories based on how much light they need to achieve the best growth. These categories are, creatively, called low light, medium light, and high light. However, plants do have some flexibility. Some plants that are classified as low light can do fine in high light conditions, often just growing faster than they would under low light. Conversely, some high light plants will slowly grow under low light conditions, though they may not achieve the colors they normally would. Most of the lights you have used in your life are incandescent. The familiar bulb shape that is ingrained in our collective consciousness, the symbol for a bright idea, is an incandescent bulb. While not particularly common, there are hoods (especially on the lower end of the price scale) that use incandescent lights. They’re readily available and they’re cheap. Unfortunately, incandescent lights are also not particularly energy efficient. A lot of the energy they use is lost as heat, which means that not only do you have to worry about them affecting the temperature of your aquarium, they’re simply not as bright as we would want them to be. If you’re trying to keep a planted tank, incandescent lights probably won’t work for you. For many years, the most common aquarium lights have been fluorescent. They are readily available, relatively cheap, fairly energy efficient, and don’t put off much heat. And because of their long popularity, experienced planted aquascapers have refined their use. There are multiple styles of fluorescent lights, which are designated by the letter T followed by a number. T12 bulbs are the oldest style of fluorescent bulb. They have the largest diameter, are the least efficient, and put off the least amount of light. T8 and T5 bulbs are progressively smaller in diameter, more efficient, brighter, and also more expensive. There are also two additional T5 variants, T5HO (High Output) and T5VHO (Very High Output) which are the same size as a T5 while even brighter still. Closely related to traditional fluorescent bulbs are compact fluorescent or power compact bulbs. In essence, these are bulbs that consist of multiple fluorescent tubes that have been bent and shaped to take up much less room and are generally able to fit into standard incandescent light fixtures. For their size, they put off much more light than alternatives. This makes them a great choice for small tanks that can’t fit a normal fluorescent tube as well as gives the option to put more bulbs (and thus more light) in the same amount of space. If you have a hood that is designed for incandescent bulbs, you can probably find a compact fluorescent that will fit and give you better results. The standard hood that comes with most aquarium kits typically comes with one or two T8 bulbs and will most likely be less than 2 watts per gallon, making them only suitable for low light plants. For higher light plants, you’ll need to find a specialty hood. Using watts per gallon gives you a generalized rule of thumb starting point, but it is nowhere near a complete method. The first, most obvious problem is that watts are a measure of the amount of energy being used, not any measure of how much light is being produced. Different bulbs have different levels of energy efficiency, so two different types of bulbs that use the same wattage can put off significantly different levels of light. Old fashioned incandescent lights are very inefficient, so even fairly high wattage incandescent lights will often only supply a low amount of light. Fluorescents are more energy efficient, though there is variability even within the fluorescent family of lights. LEDs are incredibly energy efficient and don’t use much power at all. Additionally, the design and materials of the hood and potential reflectors can dramatically alter how much light is directed downward into the tank. People have discovered that plants they have struggled with thrive after adding or replacing the reflector in their hood. Even if you could get some standardization on how much light is produced by a watt of energy, it says nothing about how much light is actually reaching the plants in your tank. As light travels, its strength decreases exponentially, a concept known as the inverse square law of light. As the distance between the light source and an object is increased, the strength of the light is decreased by the square of the change in distance. As a simplified example, image you had a tank that was 12” tall and another that was 24” tall with the light set right at the top of the tank. Because the bottom of the 24” tank is twice as far away, it would receive only ¼ of the light as the bottom of the 12” tank. Further compounding this is that the water itself will filter even more of the light, so there will be an enormous variance in the amount of light your plants are receiving depending on where your light is situated (directly on top of the tank vs. suspended some distance above it), how tall your tank is, and how much water it has to travel through. Finally, the strength of the light is not even the most important quality. Plants have evolved to best absorb specific wavelengths of light, namely in the blue and red spectrums (they reflect green light spectrum, which is what gives their green color). A light that may give off less light but in the correct spectrum may be more effective than a light that gives off more light in a less productive spectrum. LEDs are becoming increasingly popular choices for many people, and more and more aquarium kits are changing from fluorescent bulbs to LEDs. They are much more energy efficient, put off virtually no heat, have very long life spans, and are rapidly dropping in price. Additionally, LEDs allow for a wide range of customizing the light spectrum being produced. This allows for being able to precisely tune in the precise light qualities that will most benefit the plants. The downside to LEDs, though, is that they are a rapidly changing technology that hasn’t reached the same level of standardization as fluorescent bulbs. There are no rules of thumb to determine what strength of bulb is needed for what plant. Depending on the way they’re built, two different LED diodes of the same power may put off remarkably different levels of light. Finding an LED fixture that can support plant growth, especially for high light plants, still largely comes down to trial and error. At this time, the best method is to read as many reviews from others who have tried that fixture as possible. How Much Light Do You Have? For the most dedicated planted tank keepers who want to precisely control their lighting, the best method to know how much light your plants are receiving is to purchase a PAR meter that can be used underwater to measure exactly how much light is penetrating the water. PAR meters can be a significant investment, but for any aquarist who wants or needs this level of precision, there is no substitute. What, exactly, is PAR? PAR stands for Photosynthetically Available Radiation and is, quite simply, the amount of light energy (radiation) that is available for plants to utilize. By contrast, another measurement for light intensity is Lumens, which measures all of the visible light at a certain point. However, plants don’t use all visible light. They mostly use blue and red wavelengths. PAR measures the amount of light within the wavelengths that are used for photosynthesis. Keep in mind that due to the amount of light that is lost due to distance and the filtering effects of the water, you need a PAR meter that will work underwater so that you can measure how much light is reaching a specific point. What should your PAR meter be reading? A general guideline is that 15-30 should be sufficient for low light plants, 30-50 would be considered medium light, and higher than 50 should work for most high light plants. Which Aquarium Light Should I Use? 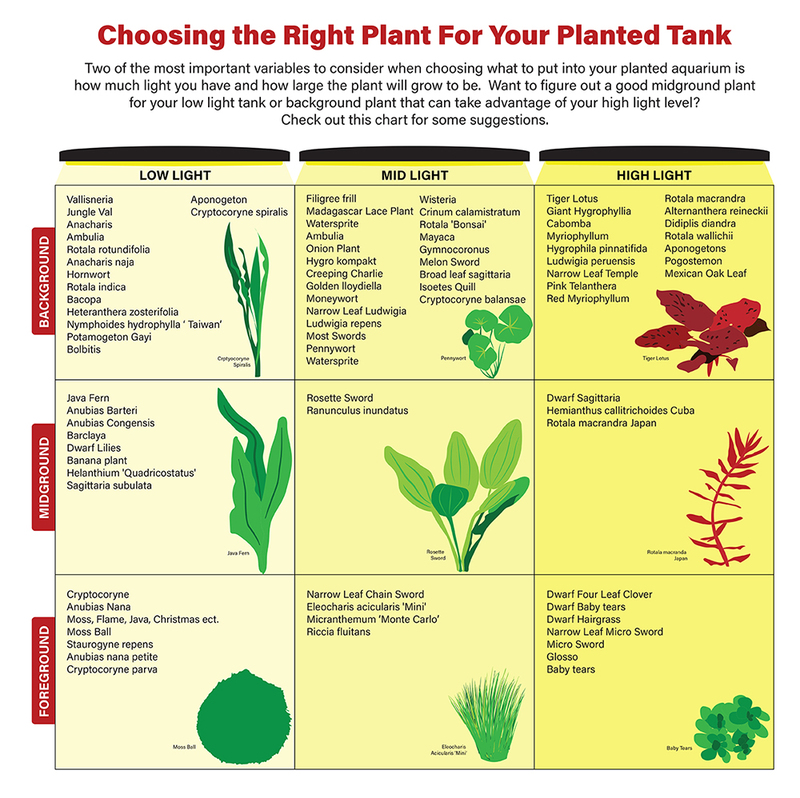 Deciding what direction you want to go in choosing an aquarium light is ultimately going to be determined by what plants you are trying to keep. If you’re wanting to keep plants that require high light levels to thrive, plants like dwarf baby tears, most aponogetons, and any plant that develops red leaves, then you will be looking for the brightest LEDs or fixtures that contain multiple T5 HOs or VHOs. If you’re keeping plants that appreciate lower light levels, such as cryptocorynes, anubias, and anacharis, you have more options. Keep in mind, though, that success with high light plants requires being willing to also use aquatic plant fertilizers and set up a CO2 system . High light levels without these will almost always lead to algae problems.